WASHINGTON — A judge was murdered this past week and led to calls for an investigation by the politically-troubled Ukrainian President Viktor Yanukovich. Reuters reported that Oleksander Lobodenko, a 34-year old judge in the central Poltava region, was shot several times in the back by at least two unknown assailants. He was murdered outside of his home. Ukrainian protesters want Yanukovich to resign after he stonewalled them in recent months after he withdrew Ukraine from a historic trade pact with the European Union. Yanukovich even pushed for a ban on protests, which only reignited the protest movement. The conflict between protesters and the government forced the embattled Yanukovich to call in sick earlier this month. The U.S., European Union and Russia have blamed each other for meddling in Ukrainian political affairs. Now, Yanukovich demands an investigation into the judge’s death. The judge recently put two anti-government protesters under house arrest for their involvement in the anti-Yanukovich protests. The Ukrainian police suggested that the judge was murdered because of his job, which pitted him against anti-government activists that stormed a city building. However, the opposition says that the government could have orchestrated this to blame the opposition and protest movement. Protesters have occupied city buildings in the capital city, but Yanukovich has announced that if they leave, they’ll be granted amnesty. 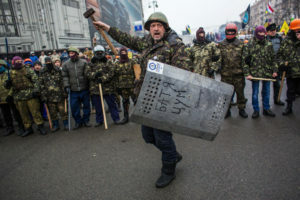 However, protesters have disappeared one by one, leading to charges against Yanukovich and the government for abductions and imprisonment for protesting his government. The protesters have also rejected the amnesty, which is set to expire on February 17th.